The archaeological site and contemporary village of Bylany is situated in flat countryside in central Bohemia, near the medieval silver-mining town of Kutna Hora. Thick layer of loess beneath the topsoil causes the agricultural fertility of the country. The Neolithic settlement area at Bylany was discovered in the 1950’s by credit of B. Soudský. Large-scale archaeological excavations were undertaken here in 1955 – 1964 and 1966 – 1967. Smaller excavations continued in 1977 – 1980 and 1990, 1993 and 2004. Seven hectares of Linearbandkeramik settlement (LBK, linear pottery culture) and subsequent Stichbandkeramik settlement (STK, stroked pottery) were excavated and explored. Archaeological research at Bylany has become one of the most important excavations of Neolithic settlement area in Europe. The excavations revealed characteristic picture of LBK settlement residues, comprising ground plans of timber pole long-houses surrounded by high number of pits (areas A, B, F). The settlement area contains the residential component with houses, and sacral component including several circle wall enclosures (Kreisgrabenanlagen, rondels) that were located at area Bylany 4. Biritual (inhumation and cremation) cemetery dating to the STK period was excavated in the Miskovice 2 area. 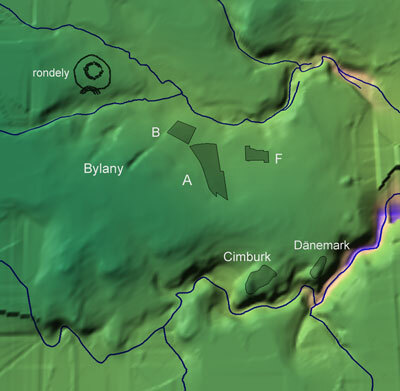 Fortified hill-top sites of Cimburk and Dänemark dating to the Chalcolithic period were excavated on the rocky hills above the canyon of the Vrchlice stream.